June seems to be a particularly busy time for celebratory occasions: weddings, anniversaries, graduations. And what’s a celebration without a little bubbly to enliven the festivities? Flutes of Champagne or sparkling wine, or bubbly transformed into a Classic Champagne Cocktail, are always delightful. But how about something a bit more seasonal? June is when ripe peaches start appearing in quantity. And they combine deliciously with bubbly (like Prosecco) in a Bellini. Delectable, festive, seasonal, gorgeous — what drink could be better for summer celebrations? Best yet, it’s easy to make (and even easier to drink). The Bellini was invented by Giuseppe Cipriani at Harry’s Bar in Venice, probably in 1948 (some accounts give an earlier date). He named the drink after Giovanni Bellini, an Italian Renaissance artist whose paintings often have a pink “glow” to them. The moniker is appropriate, because the Bellini features a pink (often orangey-pink) tint that ranges from faint to flamboyant, depending on how you make it (see Notes). This drink should be made with puree from white peaches. It’s an easy process if you have a mini food processor or a blender. For the bubbly, the original (and best) option is Prosecco — an Italian sparkling wine with a bit of sweetness to it. If you substitute Champagne or another sparkling wine, you don’t want to use brut. You want something with a bit of sugar to it, so go for a sec or demi-sec (although sec translates as “dry,” when it comes to sparkling wine nomenclature, the term indicates something sweeter). This recipe serves two — because you’ll never drink a Bellini alone! — and takes about 5 minutes to prepare. Most recipes for the Bellini are more or less the same, but I need to credit Gary Regan’s The Joy of Mixology for suggesting the addition of lemon juice. Pit the peaches. You can skin them if you want (this is probably the authentic method), but your Bellini will be less pink. See Notes for further discussion about this. Whizz the peaches with the optional lemon juice in a mini food processor or blender. Put 2 ounces of peach pulp (give or take a bit — precise measurement is not critical) into each of two champagne flutes. Fill with Prosecco (about 4 ounces per glass). 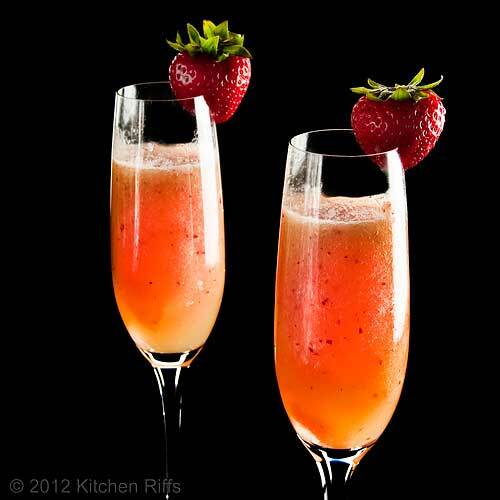 As you pour, use a long handled spoon to slowly blend the peach pulp with the Prosecco. Don’t be too vigorous in your stirring, because you don’t want the Prosecco to lose effervescence. And you’re not trying to thoroughly mix the peach and Prosecco; rather you’re just trying to get them to mingle a bit. 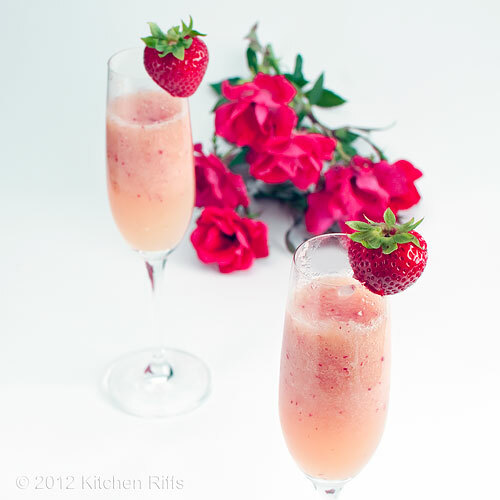 The Bellini is often served ungarnished, but I think a strawberry adds a nice slash of color. Or garnish with another berry of your choice. A standard bottle of Prosecco (or any wine or bubbly) contains 750 ml, which is about 25 ounces. So you’ll get about 6 Bellinis from a bottle. Don't buy anything too expensive (and Prosecco usually isn't costly anyway). Something around $10 — $12 or so works fine for this drink. I usually figure each peach will provide a bit more than 2 ounces of puree, so you may have some leftovers. No problem — just make another Bellini! I often skin half the peaches, and leave the skin on the others. This results in a distinct pink glow that’s a bit on the pale side — just the way I like the drink to look. (The top picture shows a Bellini made this way; the others, with a bit less or more skin.) Bottom-line: experiment, and find out how you like it. Some people strain the peach puree before adding it to the drink. Too fussy! It’s fine if your drink has a bit of body to it, I say. Gary Regan likes to put pitted peaches into the blender with lemon juice, and blend it all with 2 - 3 ice cubes. This isn’t a bad way to make peach puree, although I find it easier to use a mini food processor (without ice). If your market doesn’t have ripe white peaches in stock, you may be able to find frozen white peach puree (it’s out there, but many supermarkets don’t carry it). Failing that, you can substitute fresh yellow peaches. They change the flavor somewhat — and alter the color dramatically — but still make a good drink. Purists will argue that it’s not really a Bellini when made with yellow peaches, if that matters to you. Some recipes for the Bellini include a bit of Grand Mariner or raspberry liqueur (like Chambord). If you’d like to try this, start by adding maybe ¼ ounce to each glass. Taste, and if you decide you want a bit more, add another ¼ ounce. More than that would change the character of the drink too dramatically, IMO — although if the flavor pleases you, go for it. 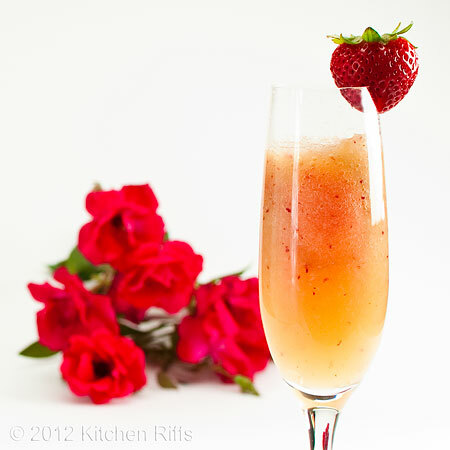 In fact, the original Bellini might have included raspberry liqueur (or perhaps cherry juice) to help color the drink. “Mmmmm,” said Mrs. Kitchen Riffs as she took her first sip of Bellini. “What a luscious drink! Great taste, wonderful color. Why don’t we have these more often?” Then she took a bite of her Cheese Straw. We were lingering over our Bellinis before dinner — another great way to enjoy them if you don’t have a celebration scheduled at the moment. They’re also terrific for brunch. Or as an afternoon refresher. Or whenever the mood strikes you. One of the (many) nice things about Bellinis: The peach puree not only provides great flavor, but also reduces the volume of alcohol. So you can easily have 2 and keep your wits about you. I rose to replenish the Cheese Straws. And fix her another Bellini. Wow, what a lovely photograph...I can almost feel the taste in my mouth! Loved this post, Kitchen Riffs! Hi Purabi, this was a fun subject to photograph, and even more fun to drink! Thanks for the kind words, and for taking time to comment. "Big bright eyes" from Mrs. KR?!! I am not a wine drinker, but I love my champagne & Prosecco! I'll take a bellini over a mimosa any day! Gorgeous photograph, too! Hi Laura, ;-) Mimosas are nice, but I prefer a Bellini, too. But unless you can find the frozen peach puree, decent fresh peaches are only in season for a few months, so in that sense the Bellini is much more seasonal. Thanks for the kind words, and the comment. Hi Alessandra, well, since it's about lunch time I think you should indulge! Thanks for taking time to comment. 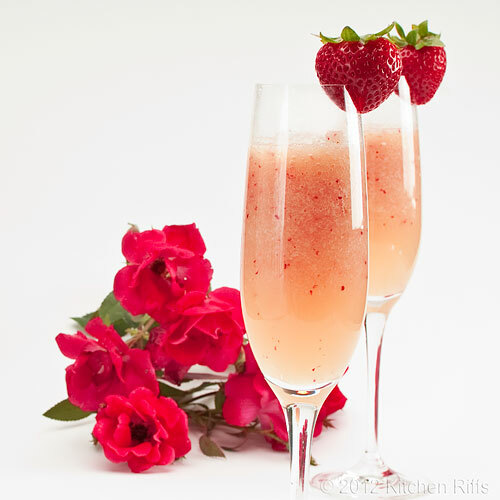 Prosecco is one of my favorite bubbly drinks and you have used it innovatively to create a picture-perfect image. Hi Marina, I should post some cat pictures - he's jealous of the ones you post! Thanks for your comment. Hi Suzanne, any kind of bubbly is OK in my opinion! Thanks for the kind words and the comment. This looks like quite the elegant drink... and with peaches it would be so delicious and sweet. Hi Carolyn, isn't this such a such cocktail? I can totally see how easy it'd be to imagine you were relaxing in Venice when you sipped one of these! Thanks for your comment. Hi Tania, it is rather on the elegant side - although I guess most things with sparkling wine are. Anyway, the peaches = Prosecco is an awesome combo. Thanks for your comment. Hi MJ, well you come here to find out these things, yes? ;-) It really is good. Glad you enjoy the dialogue with Mrs KR - it's lots of fun to write. Thanks for your comment. I would love a bellini right now even though it's cold and wintery and the wind is howling outside! A wonderful Bellini! A great summer drink. Hi Maureen, our temperature has been in the 90s, so we're about as far from cold and wintery as you can get! But a Bellini would be ideal for you - you could think warm thoughts! Thanks for your comment. Hi Rosa, I agree, one of the best summer drinks going. Thanks for your comment. Truly a summer treat...Elegant presentation! You always have amazing pictures. Hi MyFudo, it's a great drink. And given how great your photography is, that's a real compliment! Thanks for that, and for taking time to comment. Such an awesome cocktail...I had bellini before but never made it at home...thanks for the recipe. By the way, great pictures! This looks so tasty!!!! I'm going to have to try this soon. Hi Juliana, it's a great cocktail. And pretty easy to make. Toughest thing is finding white peaches, but good ones are in stores now (in the US). Thanks for the kind words, and the comment. Hi Simply Tia, it is! Definitely worth a try - I think you'll enjoy it. Thanks for your comment. You always make such lovely drinks. It's simply amazing. I can't figure out why my posts aren't showing up. Anyway this sounds wonderful. I'm not much of a drinker but will say when I do I like to have a glass or 2 of Prosecco. With the addition of peaches this would make a wonderful dessert! Hi Ilke, definitely a competition during the summer when peaches are in season! And I agree, usually no real occasion needed to celebrate with one of these. Thanks for your comment. Hi Ray, thanks so much for your very kind words, and for taking time to comment. Hi Vicki, I remember you saying you were having problems posting - weird. I'm not sure what's going on. I was having that problem posting on Disqus sites, but then I found I wasn't logged in (even though I was sure I was!). Anyway, Prosecco is quite nice. And I agree, peaches turns it into a dessert! Thanks for your comment. Hi Nami, thanks so much for your kind words! And your comment. I'm glad you're enjoying the cocktails - they're loads of fun to photograph (although sometimes the process is frustrating - they can be a difficult subject). More fun to drink them when I'm done! Hi Choc Chip Uru, thanks so much, both for your kind words and your comment. this is a beautiful cocktail and it would have been perfect if hubs and i had these glasses to toast to when we celebrated our 24th anniversary two days ago... what romantic shots... love it! Hi Malou, congrats on your 24th! That's a big deal, as you know. This would have been nice for your toast, but anything would have been wonderful, yes? It's nice to have a special drink, but better to have a special occasion. Thanks for your comment. Hi Anonymous, thanks for the kind words but particularly for the correction. I knew that, but obviously didn't write that! I've corrected the text. Thanks so much. Hi Marta, I'll bet your hubby will enjoy it! And you're right - it's a pretty girly drink (so pretty! ), so it's perfect for a night out with your girlfriends. Thanks for the comment. Absolutely Heavenly. Love the taste of history too! Hi Jenny, it's a wonderful cocktail, and one of the best summer ones I know. Thanks for your kind words, and your comment. Hi Louise, it is heavenly! And cocktail history is so interesting, whenever I know something I like to share it. Thanks for commenting. Hi Jay, thanks for the kind words, and the comment. Hi Raymund, your photos are so great that your praise is particularly sweet! Thanks for that, and for taking time to comment. The ultimate brunch drink! I'll order a bellini over a mimosa any day. Just gorgeous! Love the addition of lemon juice, it sounds like it adds a nice brightness. And I'm not sure that I realized that they had to be white peaches - very good to know indeed. Hi Katherine, it's great for brunch! And I agree re the Mimosa - nice enough, but the Bellini is special. Thanks for your comment. Hi Terra, good timing! I've heard of Bellini versions using peach schnapps or liqueur, although I've never tasted them. They sound like an interesting twist, although the original Bellini is plenty tasty. Hope you enjoy yours! Thanks for your comment. I love bellini's. They remind me of a cruise we took a few years ago; that was the only thing I ordered - they were that good! Hi Kristy, oh, a cruise + a Bellini (or two - or many!) is a wonderful thing. We've done a bit of cruising too - nice to be able to unpack only once. Thanks for your comment. This is so pretty. I am really digging this drink. It seems so girly. Something to sip in the tub. Hi Kim, it is a really pretty drink. And you're right, kinda girly. But it tastes great! Thanks for your comment. Hi Sarah, isn't the Bellini a pretty drink? And of course anything with Champagne tastes wonderful. Thanks for your comment.